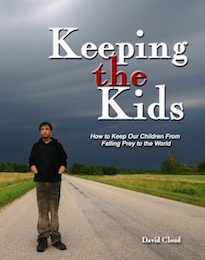 The following is from the book KEEPING THE KIDS: HOW TO KEEP THE CHILDREN FROM FALLING PREY TO THE WORLD, available from Way of Life Literature. This book aims to help parents and churches raise children to be disciples of Jesus Christ and to avoid the pitfalls of the world, the flesh, and the devil. Statistics show that a frightening percentage of children that grow up in Bible-believing churches drop out when they reach adolescence. They either go full-fledged into the world or they remain on the periphery of church life or they join a contemporary church that essentially promises them they can have Christ and the world, too. We are convinced that this does not have to be the case, because God has given many promises in His Word about child training. This book is a collaborative effort. It contains testimonies from hundreds of individuals who provided feedback to our questionnaires, as well as powerful ideas gleaned from interviews with pastors, missionaries, and church people who have raised godly children. The book deals with an extensive number of issues: The husband-wife relationship, wives as keepers at home, the father’s essential role, conversion, child discipline, the church, separation from the pop culture, discipleship of children and youth, the grandparents, effectual prayer, fasting. It deals with the destructive power of hypocrisy. It shows how to have family devotions and how parents can train their children to have a daily Bible reading time. It warns that it is not enough to tell children what to do; they must be taught to apply God’s Word to their daily lives, and it provides many powerful Bible lessons on practical Christian living toward this end, such as biblical principles for testing entertainment, for television and movie viewing, for judging clothing fashions, for making wise decisions, and for knowing God’s will. It gives pointers for winning children that are already rebellious. One chapter is entitled “How to Lose Your Child before He Is Five Years Old.” The book also has an index. The question must be asked at the outset, can we keep the kids? Is a book like this practical or is such a thing a “pipe dream”? Is it possible for churches and families to live in such a way that the children turn out right for the Lord? Many disagree with me on this and argue that since the child has a free will, the church and family can do everything right and a child might still turn out wrong. Indeed, I understand very well that every child has a free will and this is a very important truth that must not be forgotten. It is on that we will come back to it, but God has given some exhortations and promises in His Word that have greatly encouraged (and frightened) me through the 33 years of my marriage, and I want to stand on these promises. Consider the following Scripture that promises that we can see our children come to Christ. “Withhold not correction from the child: for if thou beatest him with the rod, he shall not die. Thou shalt beat him with the rod, and shalt deliver his soul from hell” (Proverbs 23:13-14). This is not only a wonderful promise; it is an amazing one. To think that parents can discipline their children in such a way that they will be saved and escape hell is a most incredible thought, and this is exactly what this Proverb promises. Of course, we know that salvation is an individual matter and it is a supernatural thing. The new birth cannot be inherited or caught, but godly discipline prepares the way for salvation by teaching the child the holiness of God, the seriousness of God’s Law, and the reality of his own sinful nature, and thus emphasizing to his heart his lost condition and urgent need of a Saviour. This provides fertile soil on which the Holy Spirit can work. Many people have fervently told me that this is not a promise but that it is a “principle” or something to that effect, but it sounds like a promise to me! What is the difference between a biblical promise and a biblical principle, anyway? Aren’t both true? I have not changed my position on this from the first time I read Proverbs 22:6 as a new Christian in 1973 until this day, 36 years later. I still believe it is a promise, and in fact it has been fulfilled in the lives of all of my children. “Notice that the first part of Proverbs 22:6 is a command, specifically stated to fathers! This is commanded activity; it makes us responsible. ... The lie that many Christians have bought into is that it is not their fault if the children turn out wrong. It is a good rationalization of sin, and it is really hurting the cause of Christ. The Bible says do it right, train him up right, and the promise of God is he will not depart from living for God. My question: is God a liar? No. Then what is the problem? I mean why are we having an epidemic of children who grow up in Christian homes and do not serve God? Not only do they not live for God, but many live like barnyard animals. ... It is the fault of the parents, specifically the father. My purpose is not to be unloving or to be mean, but God said this; I did not” (Rearing Spiritual Children, pp. 31, 32). I understand that thinking and sympathize with it greatly from a human perspective. One of my children went into the “far country” for awhile and it broke our hearts. I could have said that his rebellion was entirely a matter of his own will, that we did everything right and yet he still rebelled, but the fact is that though his rebellion was definitely an act of his own will, I know that I had a clear role in the matter by my neglect and other factors. I allowed his heart to be stolen. It could have been avoided, but I simply wasn’t there in the right way when he needed me. I am convinced that the failures only prove that Christian homes aren’t always as spiritual as they appear and that Christian parents that love the Lord and that do some things right, even many things right, might not be doing an effective job in raising disciples for Christ. David was a true man of God, a man after God’s own heart, the sweet Psalmist of Israel, a man as passionate about God as any man that has ever lived other than Jesus (e.g., “As the hart panteth after the water brooks, so panteth my soul after thee, O God,” Psalm 42:1). But David failed as a husband and father. Let me hasten to add that there are many misconceptions about Proverbs 22:6, and by addressing these, I will try to explain my understanding of this verse more precisely. First, there is the misconception that Christian parents who are faithful, active members of good churches will see their children turn out right for the Lord. The fact is that training up a child in the way he should go entails far more than taking kids to church faithfully and including them in all of the church activities. Faithfulness to church is very important, but parents can do this and still fail to do the right thing with their kids in many other ways, as we will see in this book. Some common areas of failure are neglecting to spend time with our children to teach them how to know and serve the Lord; failure to be in close communication with them; lack of godly oversight; lack of discipline or inconsistent discipline; being grouchy and angry with them instead of being Spirit-filled; criticizing them more than encouraging them; wives being bossy and non-submissive; fathers being neglectful and caught up in their own pursuits; wives of school-age children and young people working out of the home in such a manner that the children are neglected; allowing the pop culture to influence the family; letting the children develop close relationships with worldly young people; sending the kids to a public school or secular college or even a worldly Christian school or college so that they become corrupted by evil (1 Cor. 15:33); parents making decisions based on their emotions and humanistic thinking rather than based strictly on God’s Word; staying in a carnal church so that the children are adversely affected; and backing off on close parental supervision when the children become teenagers. These are a few of the ways that the training can become corrupted so that the children depart from it. Proverbs 22:6 doesn’t say this. It says that if a child is trained up in the way he should go, “when he is old, he will not depart from it.” When is old? Old is certainly not 16 or perhaps even 20. In fact, the Bible indicates that every child will “rebel” in the sense of struggling with the old nature, the Adamic “foolishness” that is bound within his heart (Prov. 22:15). Raising a child in the path of righteousness in this wicked world will not be all smooth sailing, not when the children are little and not when they are older. When is “old”? It differs from child to child. Every child matures at a different level, and this is true spiritually as well as socially and educationally and in all other areas. Some children are “old” in a biblical sense at age 18 and some don’t become “old” until they are 30! This is absolutely true, but the fact remains that the prodigal son came back home when he was still young! This proverb is actually evidence for the truth that Proverbs 22:6 is a promise, because it doesn’t promise perfect obedience and it doesn’t promise that there will be no struggle along the way. Please understand that I am not saying that we should expect our kids to go into the far country for awhile to “sow his wild oats.” We should not expect that and we should do everything possible to keep that from happening. I am simply saying that Proverbs 22:6 itself doesn’t promise the child will cleave to the right way every step of his life. Third, there is the misconception that every child will respond to discipline and training in the same way and will mature at the same rate. Fourth, there is the misconception that a child’s rebellion can be blamed on the parents. We do not believe that any person, young or old, can blame his rebellion on his parents, and the Bible doesn’t teach this. As for fault, God actually puts the onus on both the parent and the child, so the fact is that neither party can blame the other. Proverbs 22:6 says, “... when HE is old HE will not depart from it.” That refers to the child himself. Proverbs 20:11 says, “Even a child is known by his doings, whether his work be pure, and whether it be right.” Thus, the child has as much responsibility in this matter as the parents. Proverbs 22:6 must not be interpreted in isolation; we must compare Scripture with Scripture. And the Bible plainly teaches that every child has a free will and must make his or her own decision in regard to the things of God. No child can blame his rebellion on someone else; he can’t blame it a parent and he can’t blame it on a church. Christ gives light personally to every individual (John 1:9). He draws every individual (John 12:32). Christ’s promises that a man can know the truth are for every individual (John 7:17; 8:31-32). The Bible’s exhortations to seek the Lord are addressed to every individual (Jeremiah 29:13; Matthew 7:7; Hebrews 11:6). Thus, no one can blame his rebellion on someone else. While we are speaking of responsibility, we should also mention the responsibility of the church as the pillar and ground of the truth (1 Tim. 3:15). A godly church can strengthen and reinforce the efforts of the home, just as a worldly church can undermine it. Likewise a worldly home can undermine the work of a godly church in children’s lives. I have seen it both ways. Just as certain types of families tend to produce godly children, so do certain types of churches. It is no accident in either case. I find it interesting that most churches avoiding taking any blame for the young people that grow up in their midst and do not serve the Lord. Pastors typically blame the parents, and the parents typically blame the pastors, but each party has a responsibility. The same is true for Christian schools. If the parents have total responsibility and the church and school have none, what is the need for the latter? In fact, when it comes to “keeping the kids,” there are plenty of responsibilities to go around! Fifth, there is the misconception that if children are properly raised they will serve the Lord with a perfect heart and be sold out disciples of Christ. Proverbs 22:6 does not promise this, and we know that one’s level of dedication to Christ is a matter of personal choice. This is evident by the fact that children raised in the same home will turn out to have different levels of personal sanctification and spiritual zeal. This, I am convinced, is where the “free will” part comes into play most powerfully. Sixth, there is the misconception that a parent is either 100% successful or 100% a failure. The bottom line is that we are convinced that God’s Word says we can “keep the kids,” and this book is dedicated to that glorious objective. One pastor that I highly respect told me that he no longer agrees with the idea that the children are the future of the church; he believes, rather, that the people we win to Christ are the future of the church. I am convinced that both the children we keep for Christ and the people we win to Christ should be the future of the church. I have personally known large numbers of Christian families that have demonstrated the reality of Proverbs 22:6. Thank the Lord, it can be done. If you are a parent and are surrounded by Christian adults who are satisfied with a majority of their children turning out to be servants of the devil rather than servants of Christ, who make excuses for such a thing, I strongly suggest that you relocate to a church that has more wisdom, spiritual conviction, and power. The Scripture is able to make the man of God “perfect, throughly furnished unto all good works” (2 Timothy 3:16-17), and God has “given unto us all things that pertain unto life and godliness” (2 Peter 1:3). Those are very comprehensive statements of the sufficiency of the Bible. We humans don’t have all of the answers, but God’s Word contains all of the answers to any question that needs to be answered in this present life, and we need to take heed to it and leave the rest in His gracious hand.